I'm a 52 year old female. I had an arthroscopy 8 years ago and had a partial tear of the ACL on my right leg . Recently the Partial tear decided to give way to a full tear. 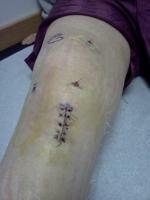 I had reconstruction surgery on Oct 7th 2011. I opted for the allograft. I recieved the nerve block. So for the first day after the surgery I couldn't feel my leg, which was a freaky feeling but ultimately I never went through the pain that others have mentioned. I started on Vicodin before the nerve block wore off per my doctors suggestion. As soon as I could feel my leg I started using the CPM machine to achieve better range of motion. I started therapy 4 days after surgery Oh and I did do "Pre hab for 6 sessions before my surgery. Day 14 I was back to work . I was ok to drive. (half an hour each way) Lucky for me I can get by with little walking at my job. I am currently on week 4 after surgery . I wear the brace to work and when I am out of the house. I just started working on the treadmill. My PT is very happy with my ROM, But I will say that I constantly stretch at home. And yes the stretching hurts. There are time when my PT stretches me and when I stretch myself that it feels like my leg may break but if you can push past that point in your stretching and hold it a bit, your leg will ultimately feel better. This definitely is a slow process but I feel hopeful.